Powers/Abilities: Before his encounter with the crashed Plodex colonization vessel, Eshu possessed no superhuman powers, despite his remarkably strong will to survive. Captured and dissected by the Plodex mothership some 40.000 years ago, Eshu used the millennia trapped inside the alien ship to study and master the Plodex technology, becoming an expert in the fields of biogenetics, cloning and eugenics. He has also mastered countless other skills, among them: extended knowledge of human anatomy, strategic planning and swordfighting. Eventually, he was able to force the ship to reconstitute his body, while part of him still remained stuck inside the computers, rendering him technically immortal, but not invulnerable.The Plodex technology under his command, though advanced, is at least 40.000 years out of date. After genetically engineering himself to be the perfect specimen of man, he possesses reflexes and stamina far beyond even peak human levels. His mind was expanded as well, allowing him to be aware of almost everything. He once learned of the Magus' attempts to subtly take over the univers despite being lightyears and dimensions apart. The armored battlesuit he wears is of the Master's own design, based on a combination of human and Plodex technology. It can sustain him for an extended period of time. Among the armor's recorded abilities are flight, energy absorption and projection, a personal forcefield, teleportation technology that allows instantaneous travel between places and even other dimensions. The Master can disguise his appearance, using a holographic system that is also capable of projecting him as an intangible 3d version anywhere he wants. It allows the Master to disguise himself as he sees fit. He used to be confined to the Plodex mothership, controlling the massive vessel through the cybernetic circuitry inside his helmet that had become a part of his head. After reconstructing himself, the Master corrected this limitation. The Master is also not beneath employing others, such as scientist Wolfgang Hessler and the Controller, using their inventions to further his goals. The excruciating pains he underwent when the Plodex machinery initially analyzed his genetic structure drove him insane, though he claims to have overcome this madness. Considering Earth and its inhabitants his rightful property, the Master has no qualms siding or aiding those who he'd otherwise consider his enemies to ensure the schemes of other world conquerors are thwarted. (Alpha Flight I#3 (fb) ) - 40.000 years ago, the man who would become the Master of the World was a nomadic hunter during Earth's last ice age, known by his fellow tribesmen as Eshu. Brash, arrogant and anti-social, the physically powerful Eshu demanded more and more food, clothing and women until the tribe banded together and cast him out. Left to fend for himself in the frozen wastes of what would later be known as Northern Canada, Eshu was one of a large number of men and animals who were lured to the crashed Plodex colonization vessel. Surviving the icy trip up north thanks to his tremendous will power and the flesh of the fallen, he finally reached his destination. When the Plodex ship sensed his approach, it automatically determined Eshu was the planet's predominant lifeform and proceeded to capture and dissect him. For days, he was conscious as the ship stripped his body apart, peeling away muscle and tissue, while grinding and pulverizing bones until his entire cellular structure had been studied and categorized. Only his brain was left intact and got hooked up to the main Plodex computer terminal, even though by then the extended torture had driven Eshu insane. Despite the insanity, Eshu's will proved indomitable. It took 30.000 years for his mind to purge itself of its madness. 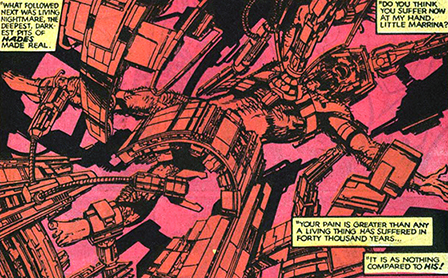 His sanity (allegedly) restored, Eshu learned he was part of the Plodex mainframe and slowly used his influence to take over the entire complex. Using the technologies to grow himself a new body, he noticed his mind was still "stuck" inside the ship, while an involuntary instinct prevented him from destroying the ship and freeing himself. (Alpha Flight I#96 (fb) ) - After fully mastering the inner workings of the Plodex vessel, the Master studied the world outside and kept himself appraised of the changing nature of humanity. He then decided to craft a life-sustaining armor that would take care of all his needs, including nourishment and waste management. (Alpha Flight I#16 (fb) ) - 5000 years before first meeting Alpha Flight, the Master started to plan for his possible and eventual escape by constructing a giant, self-sustaining fish shaped rescue vessel that was able to operate free from the Plodex mothership. (Alpha Flight I#3 (fb) ) - For the longest time, the Master believed that the millions of Plodex eggs the colonization vessel carried were all lost when the ship crash-landed in the Arctic. However, he discovered that at least two eggs had survived the crash. One of them had grown up to become Alpha Flight's Marrina, while the location of the other egg remained a mystery. Without his express permission, the ship used its built-in call signal to summon Marrina. (Alpha Flight I#2 - BTS) - Marrina received the Plodex call signal during an outdoor training session with Alpha Flight. It immediately changed the gentle, girlish creature into a feral monster that disembowelled Puck (Eugene Judd) when he was unlucky enough to stand in her way. She then took off towards the Arctic with Alpha Flight in hot pursuit aboard their Omni-Ship. (Fantastic Four I#260 - (fb) - BTS) - In preparation to deal with Marrina and to make his move, the Master increased the Plodex vessel's growth which in turn forced the ship to feed on its surroundigs, extracting all essential nutrients from the environment. This process rendered the waters around the vessel uninhabitable to homo mermanis, forcing the Atlantean barbarians that occupied the Northern Reaches to flee to Atlantis and request sanctuary with its ruler, Prince Namor the Sub-Mariner. (Fantastic Four I#260 - BTS) - When Namor went to the Arctic to investigate this mystery, he almost fell prey to the toxic waters. Barely able to escape, he travelled to New York to enlist the aid of Mr. Fantastic (Reed Richards) in dealing with the situation. He only found the Invisible Girl (Susan Richards-Storm) available to help out. (Alpha Flight I#2) - Marrina, entranced by the Plodex call signal, made her way to the mothership where she was captured and brought before the Master of the World. (Alpha Flight I#3 - (fb) - BTS) - Sensing Alpha Flight's approach, the Master ordered the Plodex ship to fire on the team's Omni-Ship, causing it to crash. 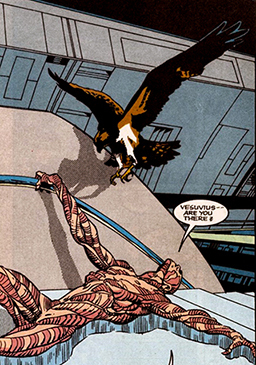 Alpha Flight survived however, and forced their way inside the massive vessel. (Alpha Flight I#3 - BTS) - Responding to the emergence of a great evil (the Plodex vessel's corruption of the environment), Snowbird encountered the burning remains of Alpha Flight's aircraft. Using her powers to peer into the past, she learned her teammates were okay and proceeded to follow them inside. (Alpha Flight I#4 - BTS) - Namor and the Invisible Girl travelled to the Arctic region and, using the imaging technology aboard the Fantasticar, determined the gigantic size of the Master's vessel. When they neared the crash site of the Omni-Jet, the Fantasicar was destroyed as well. Protecting herself and the Sub-Mariner with an invisible force bubble, Susan and Namor survived the attack. Turning invisible, Sue and Namor infiltrated the complex. (Alpha Flight I#3) - The Master had imprisoned Marrina and was studying her through invasive, intensly painful probes. Though she begged him to stop, the Master assured her that the pain she felt was nothing compared to what he experienced 40.000 years earlier. Briefly recounting his origins, he then revealed he planned to kill her and her brood-mate, for he did not wish to rule a world of fish-things. Before he could murder Marrina, the Invisible Girl and Namor showed up to stop him. (Alpha Flight I#4 - BTS) - Unaware this was all part of the Master's plan, Guardian managed to use his cybernetic technologies to interact with the Plodex ship, allowing him to locate his teammates who were lost in the labyrinthine vessel. (Alpha Flight I#4) - Quickly ordering the ship's defense systems to attack Namor and Sue, the Master decided to beat a strategic retreat via an underground monorail, while his machines proceeded to quarter Marrina. Moments after he left, Snowbird emerged from an airduct in his throneroom in her mosquito form and rescued her fellow Alphan. By then, Guardian managed to order the ship to self-destruct, seemingly killing the Master in the process. (Alpha Flight I#16 (fb) ) - Surviving the apparent destruction of the Plodex mothership, the Master was rescued by the escape vessel he had constructed five millenia before. Now free to roam the Earth, he started the search for Marrina's mate. (Alpha Flight I#15 (fb) ) - Eventually discovering the creature, he first made it loyal to him before setting it free in Lake Ontario where it quickly started feeding on the local population. This was all according to the Master's plan, who hoped the killing spree would attract the attention of Alpha Flight and the creature's mate: Marrina. (Alpha Flight I#14 - BTS) - When Puck and Heather Hudson witnessed how the Plodex grabbed a baby and dragged it into the lake, Heather dove after it but ended up severly injured in the process. Puck decided to call in Marrina to get to the bottom of things. (Alpha Flight I#15 - BTS) - Leaving her lover Namor the Sub-Mariner in Atlantis to answer the Alpha Flight priority signal Puck sent out, Marrina soon met up with her dimunitive fellow Alphan. Quickly informing herself of the crisis at hand, Marrina dove into the lake where she soon encountered her mate. This encounter activated her dormant Plodex programming and she emerged from the water in the same crazed mood as she'd been when she first heard the Plodex vessel's siren call. Puck managed to evade Marrina's attacks for a while, until Namor emerged from the waters looking for his lover. Misjudging the situation, he knocked out Puck only to realize Marrina was the one who wasn't in her right mind. (Alpha Flight I#15) - The Master, using his holographic system to appear in civilian clothes, looked on from a distance as Namor and Marrina fought. He then actively involved himself in the conflict, using his knowledge of anatomy to knock out Namor and the barely recovered Puck with a nerve pinch. (Alpha Flight I#16 - BTS) - The Master took the unconscious heroes and Marrina on board his sub-marine where he imprisoned Namor and Puck in holding cells. He revelled in showing the shocked heroes how badly Marrina's form had mutated due to the close proximity to her mate. To further prove his point about the ferocious nature of the Plodex, he opened the partition between their holding tanks and gleefully watched the alien hybrids engage in their violent mating ritual. Just then, Puck used his ancient yoga techniques to fake his own death. Distracted, the Master was puzzled by Judd's sudden collapse and freed him from his glass prison. Puck immediately attacked, knocking the Master for a loop which gave him time to free Namor as well. Severly dehydrated, the Sub-Mariner needed water to restore his strength. Quickly considering the options, Puck jumped on the Master and yanked off his helmet, unaware it had been fused to his head. He then threw the helmet at the glass seperating the control room from the Plodex bassin. The helmet only cracked the glass, forcing Namor to shatter it himself. Without his helmet, the Master couldn't control either his vessel or the Plodex monster, who went on a rampage and destroyed everything in sight. Namor managed to get Puck and Marrina out of the sub-marine before it crashed, presumably with the Plodex and the Master still inside. (Alpha Flight Annual#1 - BTS) - Hungry for revenge on Aurora and Alpha Flight who had been using her home as their base, the spirit of Gilded Lily somehow became infused with her house. Now somewhat corporeal again, she managed to access the team's Alphanex computer database and searched for potential pawns in her fight against the team. Lily reviewed several of the team's villains, including the Master of the World, Deadly Ernest and Pink Pearl, before deciding to go with her old flame Diablo. (Alpha Flight I#40 - BTS) - Struggling with her Plodex nature once more, Marrina thought back on how the Master forced her to meet her mate. She then realized, as tiny embryo sacks started to form all over her body, that the encounter had left her pregnant. (Alpha Flight I#51 - BTS) - Alpha Flight's old government liaison Gary Cody used his past connections with Heather Hudson to gain access to Maison Alpha where he covertly accessed the team's Alphanex computer database. Cody copied all the files on the team's adversaries, including the Master. (Avengers I#293 - BTS) - During her time as a massive, rampaging sea serpent, Marrina built a giant nest for herself under the waves, made from the various ships she sank. Among the shipwrecks, she laid three giant eggs that hatched shortly after Namor was forced to seemingly slay her with the Black Knight's Ebony Blade. (Alpha Flight I#78 - BTS) - Using his magics to investigate the growing darkness he sensed over Canada (caused by Llan the Sorceror), Doctor Strange received a series of visions. One of them prominently featured Marrina's hatchlings and the Master's helmet. This vision mirrored reality: Llan the Sorceror had recovered the Master's helmet from the bottom of the ocean, planning to restore the villain to his former glory. (Alpha Flight I#78 (fb) - BTS) - The Master had survived the explosion aboard his vessel. Even while heavily damaged and out of control, the ship looked after him and placed the wounded Master inside a protective capsule. Llan had the damage to the Master's vessel restored while he tended to the man himself. 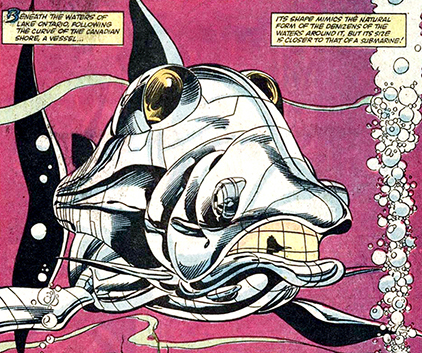 (Alpha Flight I#78) - Llan placed the helmet back on the Master's ruined face, who instantly awoke and found himself on board his Plodex sub-marine. After filling the villain in on the existence of Marrina's offspring, Llan also revealed the Alphan was still alive as well, "sleeping a false death under the waves". Just as Llan was about to leave, the Master demanded to know the status of Alpha Flight, hungry to have his revenge on them. Llan assured Eshu however, that he would take care of the heroes himself. (Alpha Flight I#89 (fb) ) - Eager to discover the limits of the human form, the Master learned of the existence of Scramble the Mixed-Up Man (Lionel Jeffries). Obtaining a sample of his remains, the Master used his technologies to extract the enzyme that gave the late mutant his control over flesh. (Alpha Flight I#87 - BTS) - The Master controlled the medical staff of the hospital Puck was delivered to after sustaining critical injuries during a fight against the Dreamqueen. The Master had him kidnapped and brought to his lair underneath the Black Hills of South Dakota. (Alpha Flight I#89 (fb) ) - At the mercy of the Master, Puck received a series of injections containing a genetic compound derived from Scramble's enzymes and Judd's own blood. As a result, while Puck's body did heal, it was turned into a grotesque version of itself in the process. (Alpha Flight I#89 - BTS) - After the initial success with Puck, the Master continued to expose test subjects to the compound, creating a slavish group of disfigured warriors he called his Remnant Men. (Alpha Flight I#89) - When Alpha Flight traced the missing Puck to the Master's lair, Shaman, Talisman and Aurora used their powers to discover what the Master had done to him. Just as Sasquatch started the process to return their horribly disfigured teammate back to normal, the Master appeared, flanked by hundreds of his Remnant Men. Briefly discussing the merits of his experimentation and his faith in the power of pain, the Master then ordered his troops to attack Alpha Flight. (Alpha Flight I#90) - About to be overrun by the Master's forces, Talisman used her powers to search Shaman's medicine pouch for just the right spell that would cure all the Remnant Men at once. The Master decided it would be best not to wait and see if she succeeded and retreated. 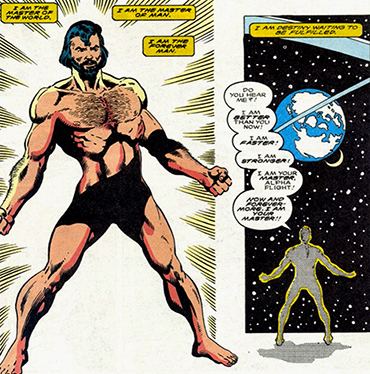 Moments after Talisman restored the Remnant Men to normal, the Master teleported himself and his Plodex vessel away, while beaming Alpha Flight and the newly normal Puck to Canada. As he left, he mused to himself that the data gained from Puck and the Remnant Men, combined with the Plodex technology, would be enough for him to start creating the ultimate biological warriors. (Alpha Flight I#96) - Suffering a crisis of faith and openly doubting if he was even worthy of his self-chosen title "Master of the World", Eshu reviewed his long life and the lithany of achievements and failures. With his pet falcon Vesuvius to keep him company, the Master realized he had reached a dead end in his development. If he truly was to become the one to rule all, he had to be better than anyone else. In order to achieve this, he injected himself with the last dose of Scramble's transmutative enzymes, specially designed to rebuild his body. The Master spent the next several days writhing in pain as his body was recreated down to the molecular level. When the process was completed, he was the perfect human specimen. His faith in his own superiority restored, he donned a new, enhanced combat armor with flight capacity and advanced weaponry. To mark his new beginning as the master over life and death, he snapped Vesuvius neck and moved on to plan his ascension as master of men. (Alpha Flight I#108) - After failing to control the minds of Alpha Flight because of Aurora's split personality, the disembodied psychic villain Brain-Drain was recruited by the Master to become the first member of his new Omega Flight. (Alpha Flight I#110 - BTS) - Sensing the Magus' plans to take over the galaxy, the Master decided to take action against him. Through the Plodex archives, he learned of the existence of the Sk'ar, an offshoot of humanity that had the innate ability to generate abberation and mania in ordinary humans. Feeding on these emotions, the Sk'ar caused considerable trouble before they and their human followers were cast out from their reality. Now trapped in their own dimension, the Sk'ar fed on their followers and then went into hibernation. (Alpha Flight I#112 (fb) - BTS) - The Sk'ar were banished from Earth using the power of the Talisman, currently worn by Elizabeth Twoyoungmen. Whoever wore the circlet of power also became the Sk'ar's jailor and the only one capable of releasing them from their extradimensional prison. (Alpha Flight I#110) - Hoping to stop the Magus' plan by allying himself with this outerdimensional menace, the Master sent his newly assembled Omega Flight to capture Talisman (Elizabeth Twoyoungmen). He then had the telepath Brain-Drain use his powers to force Talisman to unlock the dimensional door to the Sk'ar's realm. (Alpha Flight I#111 - BTS) - The Master used his armor to collect the still volatile molecules of the recently incinerated Gamma Flight foe Firebug. He stored the pyrokinetic's essence for later use. (Alpha Flight I#111) - With the Sk'ar's invasion of Toronto in progress, the Master came down from his orbiting spaceship to witness the carnage he had caused. While the members of Omega Flight struggled to resist the Sk'ar's natural, corrupting influence, the Master used his power to shield his underlings' minds from the psychic pandemonium. He then calmly rationalized the projected loss of Canada to the Sk'ar. Deeming it an acceptable price to pay to keep the Magus from taking over Earth, he figured the emotional turmoil caused by them would disrupt the harmonic energies the Magus was sending across the universe in preparation for an inevitable takeover. (Alpha Flight I#112) - While Omega Flight fought off Gamma Flight amidst the ruins of a Sk'ar infested Toronto, the Master sensed the Magus' plans had reached a critical stage. He also picked up the efforts of Moondragon, Jean Grey, Psylocke and Professor X to nudge the people of Earth to rise up, in hopes of creating a wall of psychic resonance to halt the Magus' progress. Happy to leave the fighting to his underlings, the Master decided to directly involve himself when he learned Gamma Flight was about to mount a counter offensive against the Sk'ar. To stop them, he unleashed the flaming molecules of Firebug from his armor, figuring the ensuing blaze would incinerate them. However, Witchfire erected a protective magic shield that made sure the heat only knocked them unconscious. Impressed by her potential, the Master remarked that in terms of power, Witchfire was every bit her father's daugher (Belasco is her father). Briefly entertaining the thought of sparing their lives, the Master then berated himself for even considering showing compassion. Just as he moved in for the kill, Omega Flight's leader Tech-Noir flew in to warn him the Sk'ar were trying to devour Omega Flight. To prove her point, Miss Mass was seen fleeing from the ravenous creatures. Tech-Noir fired rockets at the horde to protect her rotund teammate, which greatly angered the Master. He then tried to appease the Sk'ar by officially offering them Canada to feed on. The Sk'ar's answer consisted of trying to eat him. Instinctively fighting back to preserve his life, the Master destroyed the Sk'ar before retreating and abandoning Earth to what he considered its inevitable fate. (Alpha Flight I#130 (fb) ) - The Master managed to save James MacDonald Hudson from an eternity of floating in interdimensional oblivion. He tended to his wounds, both physical and mechanical, and expanded Hudson's mind until it matched the Master's level of consciousness. The two bonded and Hudson, operating under the new identity Antiguard, agreed to help the Master in his latest scheme. (Alpha Flight I#118 - BTS) - Deciding to take a more subtle, manipulative approach to reaching his goals, the Master assumed the identity of Joshua Lord, a billionaire industrialist who backed the ambitious right wing conservative politician Robert Hagon. With Lord's support, Hagon succesfully presented a super power registration bill to the Canadian parliament. As Lord, the Master also financially supported the actions of Reginald Tork and his Hardliners. (Alpha Flight I#126/2) - After the Hardliners failed twice to do what Lord had promised Hagon they would, the politician chewed him out at the Ottawa Heights Racquet Club. Hagon reminded Lord that he needed the Hardliners to create enough reasons for parliament to pass his superpowers registration bill. Once it had been signed into law, Hagon would make sure Lord's companies would get the exclusive contract to enforce the registration. Listening to Hagon rant, the Master had to keep himself from killing the man for daring to speak to him in so disrespectful a tone. (Alpha Flight I#128 - BTS) - The Dreamqueen, concerned with the Master's plans to turn Canada into a place of order, devoid of the emotions she thrived on, decided to intervene. She sent a series of prophetic dreams to Alpha Flight, showing them what Joshua Lord intended to do to the country if he wasn't stopped. The dream ended with the team being defeated by a mysterious invisible assailant. The following morning, Alpha Flight learned that their enemies Reginald Tork and his Hardliners were freed by the courts after Lord made sure all the charges against them were dropped. He also paid for all the property damage caused during their initial confrontation with Alpha Flight. When Tork appeared on television to reveal they were holding Alpha Flight associate Albert Louis prisoner, the team set out to even the score. (Alpha Flight I#129) - While the main team kept the Hardliners busy, Puck infiltrated their complex via the sewers. Moments after finding and knocking out Tork, he was blasted by the Master who had dropped the Joshua Lord guise. Outside, Alpha Flight had freed Louis after defeating most of the Hardliners, only to be surprised by the arrival of Omega Flight. 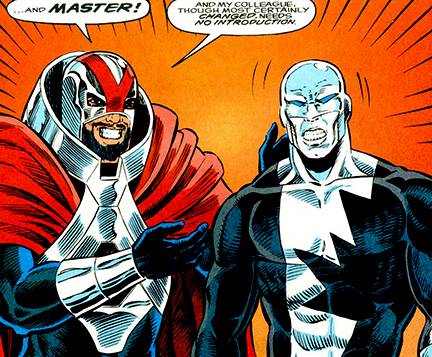 Then, the Master appeared to reveal his dual identity and his new associate: Antiguard (James MacDonald Hudson). (Alpha Flight I#130) - Content to watch the demoralized Alpha Flight try and fight their former leader and Omega Flight, the Master was forced to take action when Heather McNeil Hudson managed to rally the troops for an all-out assault. The Master took an active hand in fighting Alpha Flight and the hastily summoned Beta Flight. He even had to contend with Puck, recovered from the Master's blast thanks to the Dreamqueen, who started to use the Hardliners' base defenses to attack him. Still, the Master easily withstood the heroes' attacks, until Heather managed to get through to Antiguard, causing him to attack the Master as well. Shocked to be betrayed by a man he considered an equal and a friend, the Master abandoned his plan to bring order to Canada and teleported away. (Avengers Unplugged#5 - BTS) - The Master planted a device inside the brain of the Controller (Basil Sandhurst) that allowed him to control him. To test the effectiveness of his new thrall, he sent the Controller to fight Photon (Monica Rambeau). (Heroes for Hire I#1 - BTS) - In the aftermath of the Onslaught incident, the Master decided the time was ripe to seize control of Earth and guide it towards the future he envisioned for his property. In need of henchmen, he enlisted the U-Foes and his former pawn the Controller. (Heroes For Hire I#12 (fb) ) - Evolved from a tiger by the High Evolutionary to fight the Man-Beast, the neophyte vigilante White Tiger approached the Master when he claimed to have knowledge of the villain's current whereabouts. Promising to give her the information if she retrieved a piece of technology for him, the White Tiger complied. However, she rigged the artifact to explode as soon as the Master told her the Man-Beast was incarcerated at the Vault. Enraged by this deceit, the Master sent the U-Foes to stage a mass breakout at the Vault, denying the White Tiger her prey. (Heroes For Hire I#1) - The Master watched the U-Foes succesfully infiltrate the Vault, freeing most of the supervillain population in the process. He then ordered the reluctant U-Foes to prepare for the next phase of the mission, reminding them how he saved their lives and could still rethink that decision. (Heroes For Hire I#1 - BTS) - Equipped with a tailor-made copy of the Controller's mind control disc, the U-Foes acted on the Master's orders and ambushed their old foe the Hulk. Planting the disc at the back of his neck was sufficient to sway the behemoth to their side. With their new teammate in tow, the U-Foes travelled to New York for the next phase of the Master's plan: controlling the minds of the world's top scientists attending a symposium at the United Nations Plaza in New York. Thanks to the Hulk's intimidating presence, everyone cooperated, especially after they were outfitted with control discs that drained the knowledge straight from their brains. Even though a band of heroes, among them Hercules, White Tiger and Iron Fist, intervened, the Master got the data he wanted and the U-Foes escaped. 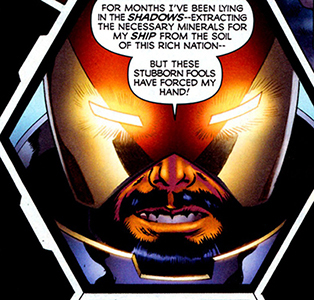 In the aftermath, the Master decided to keep a close eye on Rand and Heroes for Hire (as the group of heroes decided to call themselves), figuring they might be trouble. (Heroes For Hire I#11 - BTS) - Shortly after Iron Fist formed the new Heroes For Hire as a subsidiary of the multinational Oracle Industries, the Master of the World used his technology to hack the internal programming of Oracle's android CEO Jim Hammond. The Master planted instructions inside his mind, turning the original Human Torch into a sleeper agent. (Heroes For Hire I#2) - The Master sent the U-Foes to kidnap Luke Cage. Fighting Power Man inside his movie theatre, the foursome eventually managed to overpower him and deliver Cage to the Master. Enraged at being chained, Cage piped down when the Master told him he had something to discuss which mattered to the entire world. (Heroes For Hire I#3) - Agreeing to listen, but unwilling to do so chained at the Master's feet, Cage broke free from his bonds. When he tried to assault the Master, he was effortlessly and forcefully rebuffed by the villain's force field. Offering his guest a libation, the Master explained to Cage how the world's problems like pollution, overpopulation and dwindling natural resources could only be solved by him. Luke Cage became enraged by the Master's suggested solution: Exterminating about 70 percent of the world's population over the course of a generation through the selected use of war, famine and biological warfare. He calmly rationalized to a seething Cage that his origins made him uniquely qualified to make the decisions any single country or world leader would be unable or unwilling to make. The Master then asked Cage to join the Iron Fist's new Heroes For Hire, revealing that Rand's interest might differ from his long term plans and he simply wanted to be kept informed. The Master handed Luke one of the Controller's discs, modified into a communications device, should he wish to contact him. (Heroes For Hire I#3 - BTS) - Luke Cage joined Heroes For Hire as requested and started working for the Master, but had no intentions of letting the mad man go through with his proposed genocide. (Heroes For Hire I#4) - Sensing Heroes For Hire was about to start an active search for the U-Foes and the Controller, the Master decided a bit of misdirection was required. He ordered the villains to seek out the team and allow themselves to be captured, but promised he would see to it they'd be released shortly afterwards. Aware of the fact the Master now had Cage (and possibly Hammond) working for him, the U-Foes refused to be captured and threatened to reveal the Master's plans should they be imprisoned. Momentarily irked, the Master offered a compromise and asked the U-Foes to make sure the Controller was captured. The foursome agreed, but their leader Vector (Simon Utrecht) coldly added this would be the last little job they ever did for him. Setting a trap for Heroes for Hire at LaGuardia Airport in New York, the U-Foes and the Controller attacked the team. After a while, the U-Foes decided to leave the Controller behind, but when they tried to go, the Master zapped them into a comatose state. Watching the U-Foes and the Controller being taken away, he remarked losing them did not matter, because he had far more dependable people serving him now. (Heroes For Hire I#5) - Using the communicator he was given, Luke Cage contacted the Master of the World to fill him in on recent events. Intrigued to hear about the Eternal Sersi warning the team about the possible return of the Celestials, Eshu admitted he knew very little about them or their Deviant and Eternal offspring, despite having been alive during the space gods' past two visits to Earth. Further knowledge on both races was required if his masterplan was to succeed. That's why he asked Cage to gather as much information about this case as he could, without putting himself in too much danger. Should Cage find himself in danger after all, the Master promised to aid him in whatever way he could. They were friends, after all. (Heroes For Hire I#8) - Upon returning from the mission to Deviant Lemuria, Cage called Chuck (as he called the Master) to talk about what he had learned during the adventure and the team's subsequent team-up battle with the Thunderbolts against the Super-Adaptoid. The Master was fascinated by the notion the Deviants were able to form a group consciousness they called an Anti-Mind and was amused by the Thunderbolts turning out to be the Masters of Evil in disguise. He was curious however why Cage kept calling him "Chuck", with a chuckle the African American superhero stated he sure as heck wasn't going to be calling him "master". Apologizing for not realizing the cultural connotations in America between whites and blacks and his name, the Master proposed Luke called him by his original name: Eshu. (Heroes For Hire I#11 (fb) ) - Unaware he was working for the Master, Symkarian biogeneticist Wolfgang Hessler was developing bio technology essential to his plan. When Hessler learned what his work was about to be used for, he fled to his homeland and requested protection from Silver Sable and the Wild Pack. (Heroes For Hire I#10 - BTS) - The Master ordered Jim Hammond to send the Heroes for Hire after Hessler. (Heroes For Hire I#10) - While the Master planned his global extermination scheme, he considered the newly arisen possible complications to his schemes: The recently returned Avengers and Fantastic Four might attract the attention of Doctor Doom, Thanos, Kang and the Red Skull, supervillains whose agendas conflicted with his. Still, he had faith that thanks to his allies, victory was assured. (Heroes For Hire I#10 - BTS) - Iron Fist admitted to Luke that he had summoned his mystical, outerdimensional homeland of K'un-Lun to this dimension and had tied its arrival to his own heartbeat. This meant the next time K'un-Lun would be in synch with Earth's reality (at the dawn of the new millennium), the two would merge and manifest wherever Iron Fist happened to be. After hearing how his best friend was essentially responsible for a future invasion that only his death could prevent, Cage suggested Daniel Rand informed Oracle CEO Jim Hammond as well. Equally stunned by the stunt Rand pulled, Hammond however tabled the subject because they had been hired for a mission to Symkaria by a classified client. Aided by Misty Knight and Colleen Wing, Iron Fist and Cage were to infiltrate Symkaria, avoid or fight off Silver Sable and her Wild Pack in order to retrieve Professor Wolfgang Hessler, a biotechnician and geneticist specializing in weapons. According to the client, Hessler had recently completed a deadly bioweapon he planned to sell, the Heroes for Hire were to retrieve him to prevent that from happening. Hammond informed the foursome another freelance operative would rendezvous with them en route: Deadpool. (Heroes For Hire I#11) - Having lost the fight with Sable and the Wild Pack, the Heroes for Hire were jailed. Playing along until he was alone in his cell, Luke Cage broke his bonds and contacted Eshu to find out what was going on. Learning that Hessler used to work for him, Cage was asked to use his communication device (a modified Controller's disc) to retrieve the information directly from his mind. Breaking out and finding Hessler, Cage was about to use the control disc on him when he learned that Hessler fled to Symkaria to prepare a counter measure. Figuring Cage might have second thoughts, the Master's 3D form emerged from the disc and urged him on, thereby blowing his cover to both the Heroes for Hire and the Wild Pack. Cursing Eshu under his breath, Cage slapped the control disc on Hessler and fought of his friends until the information had been downloaded. He and Hessler were then retrieved by the Master's team of special operatives, who beamed in and out within seconds. Later, alone in his citadel, the Master decided the threat Iron Fist and K'un-Lun posed had to be dealt with. He contacted Hammond and ordered him to conveniently leak his location, so Heroes for Hire could find him. He also told the former superhero to lead the mission himself. (Heroes For Hire I#12 - BTS) - Eshu and Cage travelled to the submerged Hydra Island, the former base of the terrorist group was ideally suited to carry out the Master's plan to reduce the world's population. Using the information retrieved from Professor Hessler's mind, the Master produced enough of Compound Omega to carry out his scheme. (Heroes For Hire I#12) - After Hydra Island was airborne, the Master revealed his plans to Luke Cage: He was about to unleash the sterilizing Compound Omega, making sure only he could control the birthtrate. This way, the problem of overpopulation would organically solve itself over the course of a generation or so. Anyone on board Hydra Island was safe, protected by a force field, while the island's defenses included EMP generators that made it impenetrable for any sort of man made craft. To combat the expected resistance by superhumans, the Master introduced Luke to his latest creation: Strike Force One, clones of all the Heroes for Hire members (except Cage) who were all programmed with a copy of the Master's memories and peronality. The Master ordered Strike Force One to deal with the fast approaching Heroes for Hire, stressing the fact that Iron Fist could not be allowed to survive. While H4H tried to best their evil clones and Jim Hammond who was being forced by the Master's programming to attack his friends, Eshu and Cage retreated to an extra shielded section of the island where the Master planned to launch the Compound Omega charges from. Moments before he could press the button, Luke slammed him into a wall and revealed to the stunned Eshu that he had been stringing him along until the time was right to put him down like the sick dog he is. Shocked to see his friendship betrayed, the Master fought back but soon realized the wall Cage threw him into contained the flight controls of Hydra Island. The base was now heading out to space, which was exactly what Cage had planned. As soon as the island had cleared the atmosphere, Cage would try and vent the deadly bio weapon into outer space. The Master redoubled his efforts to beat Cage and gain control of the situation, but was beaten when Cage ripped two power cords out of the floor and used them to electrocute Eshu, frying himself in the process as well. With the Master unconscious, the severely injured Luke Cage used his last ounce of strength to blow Compound Omega safely into space. By then, H4H had defeated Strike Force One and arrived to help out Cage. Ordering them to the escape pods because Hydra Island had spun wildly off course and was about to burn up in the atmosphere, Cage and the others left the Master behind. (Avengers III#45 - BTS) - Surviving the destruction of Hydra Island, the Master of the World returned to the Plodex mothership in the Arctic and decided to try a new tact. Still interested in ruling the planet and ridding it of all unwanted influences, he decided to let humanity destroy itself by secretly supporting corrupt politicians, making sure the wrong people got elected to positions of power and destablizing the political and sociological climate across the world. The Master also started a secret network of underground tunnels, laced with self-sustaining Plodex technology that reached all throughout North America. To occupy his time, he retrieved the comatose body of Marrina and continued his experiments on Plodex DNA. One of his attemps, using a sample most likely derived from Marrina, resulted in the creation of a new breed: The incredibly ferocious and formidable Plodex Wolves. (Avengers III#45) - When Kang the Conqueror arrived with his son Scarlet Centurion (Marcus Kang) and an army from the future, the Master decided to get involved after the initial fighting had quieted down and Kang was busy preparing his first major objective. Without prior warning, the Master activated his underground network and erected giant defense ringwalls around most of the major cities in North America, while making his presence known to the Avengers. (Avengers III#46 (fb) - BTS) - While the Avengers investigated the defensive capabilities of the Master's ringwalls, and found them formidable, the Wasp was puzzled by the reason why the villain would involve himself in the conflict. When Jarvis offered that it might be a stroke of luck to have him on their side, the Wasp revealed that she'd been getting reports on dozens of kidnapped governors, senators and mayors across the country. Thy were all abducted by Plodex Wolves who used the Master's tunnel network to quickly escape with their prey. In Boston, Stingray (Walter Newell) happened to witness one such abduction and followed the Plodex's trail. While she was waiting to hear back from Stingray, Wasp already assembled a team of Avengers consisting of Warbird, Quicksilver, Yellowjacket and Silverclaw to back him up. Appointing Warbird to the position of teamleader, Wasp ordered the team to infiltrate the Master's facility up north and either convince him to put the armaments at their service, or take control of it by force. (Avengers III#46) - Stingray located the Master's control facility north of Tehek Lake in Canada. He snuck in and overheard the Master revealing his scheme to the dozens of politicians and chief executives the Plodex Wolves had delivered to him. He told them they were all going to be released, but not before he outfitted them with control technology that made them unwaveringly loyal to him, while also supplying his new slaves with technology to recruit others to the cause. He then revealed he only erected the defense walls to save North America for himself, allowing Kang and the defenders of the Earth to tear each other apart, while he waited to pick off whoever was left standing at his own leisurely pace. However, even the new world order he envisioned required administrators and that's where the kidnapped dignitaries came in. Some time later, the Master noticed the Avengers near his facility. Appearing on all the monitors near their location, he mocked the team for even attempting to infiltrate a base that was an extension of himself. He then sent in his Plodex Wolves to deal with the heroes. When the Wolves proved incapable of defeating the Avengers, the Master simply blew up the section of his base containing the Avengers. (Avengers III#47 - BTS) - Making sure there were no survivors after the explosion of the Plodex base section, the Master sent in a number of Plodex Wolves. Warbird, with a little help from Kang's son Marcus, fought them off before rejoining the Avengers for a renewed assault on the Master's base. (Avengers III#48 - BTS) - The Avengers infiltrated the Master's facility once more and were surprised the villain didn't detect them even though they had been inside for hours and all the detection systems around them were operative. Suspecting a trap, they were unaware their free reign was actually the work of Marcus', who used the resources of his father's massive orbital space station Damocles Base to shield the heroes from the Master's scrutiny. (Avengers III#48) - Distracted when the other Avengers attacked Damocles Base, Marcus could no longer keep Warbird and the others hidden. Detected by the Master while they entered his control area, the Avengers had to fight off more Plodex Wolves while Warbird faced the Master himself, who had drawn a huge blade. Toying with Warbird and boasting of his superiority, the Master drew first blood. This angered the beleagured Carol to such a degree, she decided to stop treating him like a typical megalomaniac or bank robber. Proving her point, she grabbed a shard of metal and stabbed the Master to death, much to the shock and suprise of her teammates and the surviving Plodex Wolves. (Avengers III#49 - BTS) - With the Master dead, the Plodex defense walls around Washington were not sufficient to hold off Kang the Conqueror's all-out assault on the city. Kang ended up eradicating every single living thing within the city limits. (Avengers III#52 - BTS) - After many weeks in which Kang took over most of America and imprisoned several Avengers, the combined efforts of Tony Stark, Hank Pym, Walter Newell and Dane Whitman were sufficient to decipher enough of the Master's Plodex technology to operate his defense walls. While the Wasp rallied the remaining free Avengers and their allies, Warbird was plagued by doubt about killing the Master. She confided in the Black Knight that, if she hadn't killed him, Washington D.C. might not have happened. The Knight assured her she did the right thing by stopping him, figuring the Master's plans would eventually have resulted in even more dead. The next morning, a new defense wall rose up around Kang's citadel on the eastern seaboard, signalling the counterattack had begun. (Avengers III#54 - BTS) - Days after Kang had been defeated, Warbird told Captain America about killing the Master, and how she was still not sure if it was the right thing to do, in light of the destruction of Washington D.C. She indirectly requested a formal court martial hearing to discuss her actions. Returning to the Masters' base to celebrate their victory, the Avengers were just about to enjoy some champagne when they heard an alarm go off. Unsure of what it meant, the Black Knight deduced the system was asking for an override code of sorts. (Avengers III#55 (fb) - BTS) - Failing to provide the proper override authorization, the Master's computers started a countdown, forcing the Avengers to rapidly evacuate the facility, even as it reduced itself to dust, along with all the walls erected around North America. All that was left was a big hole in the ice where the facility used to be and inorganic dust that defied analysis. (Avengers III#55 - BTS) - Investigating the apparent disintegration of the Master's base, the Black Knight admitted he couldn't tell if the destruction was total or that part of the base had managed to slip away. A few days after returning to their New York headquarters, the Avengers held the court-martial Warbird had requested to review the events that led to her killing the Master of the World. After hearing all the evidence, the team decided that Carol's actions were regrettable but justifiable, considering the circumstances. (Alpha Flight IV#0.1 - BTS) - After the events of the Chaos War, the Master was among an unknown number of people who returned to life. He resumed his plans to impose his order on the world from the shadows. First, by creating a mind control device called Unity, based on the Plodex technology that had analyzed him 40.000 years earlier. Only this time, it rebuilt the victim into an exact replica who was willing to accept the Master's point of view. However, those processed by Unity ended up with only four toes on their feet. 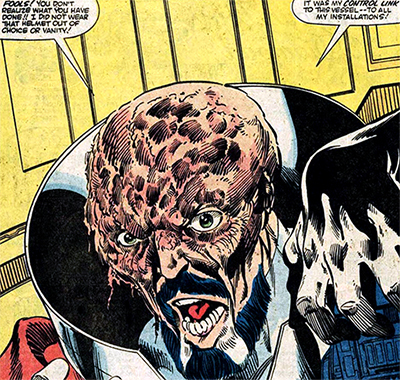 The Master used the Unity device on the braindead former Alpha Flight associate Gary Cody. Restoring his cognizance, the Master urged Cody on to turn to politics. Founding the Unity Party and exploiting his connections to the beloved and popular Alpha Flight, Cody managed to get elected Canada's new prime minister. At some unrevealed point in time, the Master captured and exposed Vindicator (Heather Hudson) to the Unity process. He not only secretly bound her to his will, he also exploited the fact the Hudsons lost custody of their baby daughter Alice (due to them being dead), as a personal reason to turn against her husband and Alpha Flight. (Alpha Flight IV#1 - BTS) - Capitalizing on the global crisis of the Hammer Wielders and the assault of Nerkkod (Attuma), prime minister Cody declared marshall law, much to the chagrin of Alpha Flight's leader Guardian. However, Cody prepared to send a legion of Box robots to stop them, while Vindicator turned on her husband. (Alpha Flight IV#2 - BTS) - With most of Alpha Flight captured, Cody used his extended authority to arrest all his political opponents, dissidents, critics and reporters and had them deported. Troops also arrested Northstar's boyfriend Kyle Jinadu. Heather meanwhile brought her husband to Department H to be the next subject of the Unity process, but he was rescued by the timely arrival of Puck and Northstar. Annoyed at having failed to convert Mac, prime minister Cody assured her she did fine, while pointing out that Hudson's fellow Alphan Aurora was about to be subjected to the Unity process. (Alpha Flight IV#3 - BTS) - Rescuing Aurora moments before Unity could take effect, Alpha Flight was stunned to learn the mentally ill woman was actually looking forward to the procedure, figuring it might cure her. She flew off in a huff, only to rejoin later on, while Guardian, Puck and Northstar freed Marrina, Snowbird, Sasquatch and Shaman. Going undercover to plan their next move, they watched prime minister Cody announce on the news that Guardian and the Alphans under his command were in league with the Hammer Wielders. He then introduced Vindicator, who swore to assemble a new team, called Alpha Strike, to hunt them down. 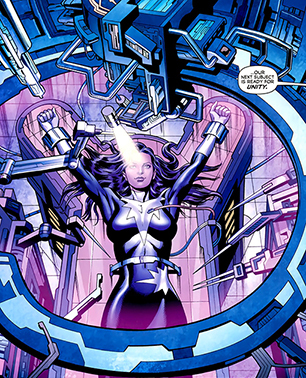 At Department H, the Unity device was prepped to convert the first two Strike recruits: the Purple Woman (Kara Killgrave) and Alpha Flight foe Citadel. Meanwhile, Vindicator recruited Ranark the Ravager, servant of the Great Beasts. (Alpha Flight IV#4) - While the rogue members of Alpha Flight tried to stay out of the hands of the law, Vindicator killed her daughter's legal guardians on a trumped up charge. She returned with baby Alice to Department H where they were greeted by the other members of Alpha Strike and the Master of the World. The Master then welcomed Northstar's boyfriend Kyle, who had just went through the Unity process and was ready to help the villain destroy Alpha Flight. (Alpha Flight IV#4 - BTS) - Still looking for his missing boyfriend Kyle, Northstar learned of the existence of a massive work camp in the woods of Sasketchwan. When Shaman teleported the team there, they didn't find Kyle, but did uncover what had happened to the dissidents and reporters Cody had arrested: They had been outfitted with early prototypes of James Hudson's original armor and were forced to use it to dig up Plodex technology, including a giant spaceship. The presence of Plodex artifacts was enough evidence for them to conclude the Master was involved. Leading a revolt and convincing the workers their work gear was powerful enough to fight with, Alpha Flight had a small resistance army on their side. (Alpha Flight IV#5 - BTS) - Robbing a bank in order to be able to afford his services, Guardian hired the Taskmaster to give his army a crash course in combat training. Furthermore, figuring out they needed a mole inside Department H, Alpha Flight sent their schizophrenic teammate Aurora back. Hoping that the Unity treatment would only affect her other self, Jeanne-Marie Beaubier, the team hoped having an informant would give them an essential leg up. (Alpha Flight IV#5) - The Master had Kyle appear on television to badmouth his lover, Alpha Flight and all they stood for, in hopes of provoking the hotheaded Northstar to give away his location. Gary Cody, convinced he had Guardian and Alpha Flight on the run, figured they had won already. The Master and Vindicator reminded him of how devious and intelligent Alpha Flight's leader was, with the Master adding that he wouldn't allow mankind's chance at ascendancy to be ruined by overconfidence on Cody's part. He then turned to greet the newly arrived Aurora, reverted to her Jeanne-Marie persona, who had come back to Department H to receive the Unity treatment. Making sure she wouldn't try anything, the Master had the Purple Woman mind control her. As the Unity process started, Shaman appeared inside the woman's mind to comfort her. (Alpha Flight IV#6) - While Alpha Flight fought Alpha Strike to capture Northstar's lover Kyle, the Master of the World visited with Heather Hudson and her baby girl Alice. Planning to subject the child to the Unity process as well, he took Alice on his lap, the girl cheerfully refering to him as "Unca Masta". He proceeded to tell the young child a simplified version of his origin story and how the Plodex who had sent the ship hoped to create monsters, not realizing that by capturing him, they inadvertently created this planet's savior. Referring to his Unity technology, he revealed that soon the entire world would be perfected by it, as a prelude to a future where humanity would become conquerors of the universe. (Alpha Flight IV#6 - BTS) - Back at Guardian's resistance camp, shielded by Shaman's magics, a makeshift "miracle machine" designed to reverse the effects of the Unity process. While, at the US/Canadian border, Wolverine queued in line to enter the country in an attempt to investigate if the rumors and news reports about either Guardian or Vindicator turning evil were right. (Alpha Flight IV#7 - BTS) - Dropping in on Heather and baby Alice while they were vacationing at Ontario's Port Elgin under heavy guard, Wolverine quickly learned Heather was the one who had gone off the deep end. Rescued by Alpha Flight and taken to their camp in the Saint Elias mountains, Wolverine got chewed out by Guardian for ruining the last chance he had to rescue his daughter thanks to his little stunt. Their argument resulted in a friendly scuffle that nonetheless resulted in Shaman momentarily dropping the cloaking spells that prevented Alpha Strike member Ranark from detecting them. Moments later, Alpha Strike teleported in for a final confrontation. During the fight, Alpha Flight did all they could to protect their makeshift Unity-restoration device, eventually managing to get their hands on the final missing component: the Purple Woman. (Alpha Flight IV#7) - Furious when he realized the Unity process could be undone, the Master decided to get personally involved. He launched a giant Plodex vessel hidden underneath Ottawa's Parliament Hill and set off to remedy the situation, claiming Alpha Flight must die for the good of humanity. 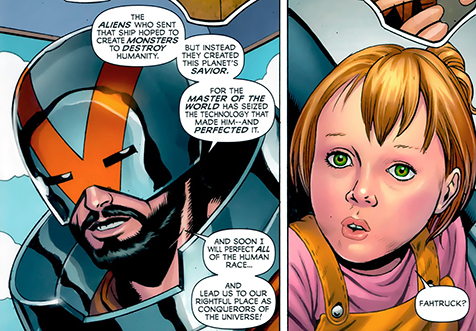 (Alpha Flight IV#8) - Unremorseful for the death and destruction he caused by launching the Plodex vessel, the Master, with baby Alice on his arm, made his way to the Saint Elias mountains. Launching the vessel's booster rockets, the resulting firestorm accidentally killed prime minister Gary Cody. Monitoring the fight between Alpha Flight and Strike en route, the Master learned the workings of the Anti-Unity machine. The device was designed to use the Purple Woman's pheromones to undo the mind control like effect the Unity process had on the body. 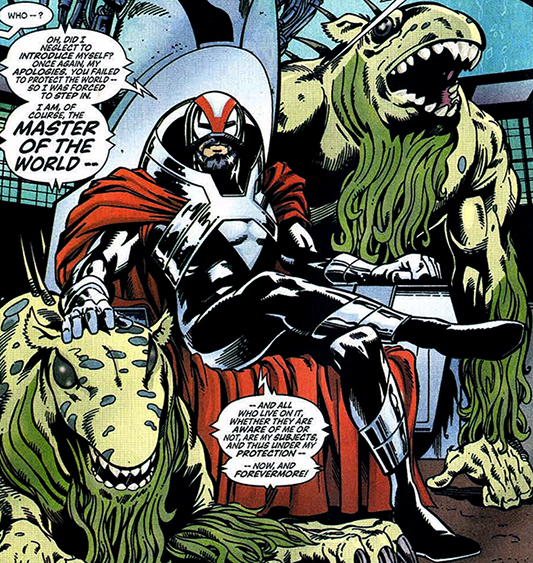 Once he arrived over Guardian's resistance camp, the Taskmaster unleashed his prototype armor-wearing trainees to fight and distract the Master. As soon as Guardian realized the villain was keeping his daughter hostage inside, he burst in and fought the Master, while Vindicator tried to stop him. Reaching a stalemate, the Master ordered Guardian to turn over the design plans for his pheromone device, threatening to kill both Hudson and his wife if he refused. Adding insult to injury, Eshu also claimed he would raise baby Alice as either his heir or his mate. Not realizing that Heather's unity reprogramming hinged on the fact she never wanted to leave her daughter or have her be endangered again, Vindicator was free to act against him. Succumbing to the overwhelming firepower of both Guardian and Vindicator, the Master apparently died when his ship crashed to the ground. I've always liked the Master, even though his earliest appearances are a bit of a nonsensical mess. If he is truly that concerned with preventing the Plodex from mating or gaining a foothold on Earth, why did he wait 40.000 years to find out if all the embryos were really destroyed after all? And when he finally learns of Marrina, he doesn't even realize the vessel he's supposed to be the brains of summoned her? Yet, when she appears he's already fully prepared to deal with her? In his next appearance, he has miraculously found another Plodex who conveniently enough also happens to be Marrina's designated mate. But instead of exterminating it, like he was desperate to do with Marrina, he actively tries to help it mate by luring her to it? That just doesn't make sense...And let's not forget Byrne blatantly borrowed from himself when he came up with the Master's "my brain is part of an alien ship, that's why I wear this helmet" bit...Lest we forget, that's pretty much exactly what happened to Mr. Fantastic a year and a half earlier in Fantastic Four I#254, The Minds Of Mantracora. Speaking of borrowing from the greats, while writing his profile it became obvious the Master is essentially a cross between the classic DC villains Vandal Savage and Ra's Al Ghul... Salient detail in this: Ra's Al Ghul creator Dennis "Denny" O'Neil served as Alpha Flight editor when Byrne introduced the Master. Surely, the notion of an immortal caveman turned master strategist using long term plots to take over the planet must have sounded somewhat familiar? 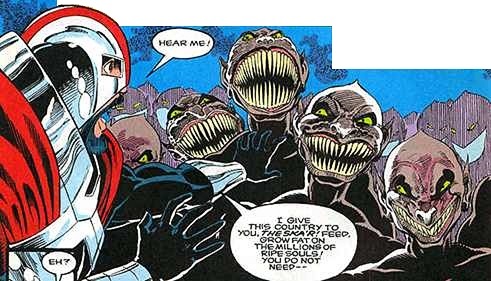 It's a little ironic Heroes For Hire scooped up the Master as its main villain when it debuted in July 1997, while only a month after that the second Alpha Flight series launched. With the real Master already spoken for, the most we got to see of him during that run were some training robots fashioned after him. Finally: While most of the Master's schemes involve him ruling over a world where everyone is as perfect as he is (which would make him rather common, by comparison), it seems all he wants is some company. It's hard not to feel for the man whose trust was betrayed time and again, by Antiguard, Luke Cage and most recently Vindicator... even if his long term career goals are wiping out close to 75 percent of humanity. That must be one heck of a LinkedIn career goal. The Master of the World received profiles in Official Handbook of the Marvel Universe I#8, Official Handbook of the Marvel Universe Deluxe Edition#8, Official Handbook of the Marvel Universe Master Edition#13, All-New Official Handbook of the Marvel Universe I#7, Official Handbook of the Marvel Universe A-Z I#7 and Marvel Encyclopedia: Fantastic Four. Desperate to make sure their newly assembled Alpha Flight team was combat ready, Department H had their chief engineer Ko Bin Su come up with a line of "semi-organic synthoids". These automatons were all styled after the Master of the World, intended to be used as training tools designed to: "Encourage the team's emotional commitment to an existent adversary". To maximize their efficiency, each individual unit had been custom designed to fight a specific member of Alpha Flight. Radius' Master for instance, could become intangible which rendered the young mutant's protective forcefield apparently useless. Guardian's counterpart could negate his electromagnetic powers, while Puck was assigned a Master specialized in counteracting his acrobatics and Murmur faced a Master who was immune to her powers of tactile mind control. After two brief engagements, the Masters were never seen again. Designed by the Master to act independently from the main Plodex mothership, construction of this giant, fish shaped sub-marine/escape vessel started 5000 years ago. The ship lay dormant for centuries after its completion, first springing to life when it saved the Master after the explosion of his Arctic base. The ship was outfitted with advanced technologies that served all his needs, including holding pods for prisoners, two giant tanks used to contain Marrina and her Plodex mate and an array of scanners and other unrevealed research equipment. After springing a leak and without the Master controlling the vessel through his helmet, the ship sank. Before it ceased to function completely, and acting on its own, the ship placed its owner in a protective capsule. Later, Llan the Sorceror restored the damaged vessel, located the Master and his control helmet and made sure the villain was well taken care off aboard his newly sea worthy craft. Despite the fact his armor took care of all his bodily needs, the Master still employed a small staff of scantily clad females, all outfitted with a replica of his own helmet. It's more than likely these women were clones of the Master's own design, their obedience guaranteed through control technology in their headgear. In order to disrupt the plans of Kang the Conqueror, the Master used Plodex technology to create a vast network of defense walls throughout North America. Controlled by the Master from his headquarters in Northern Canada, the ring walls rose up to enclose major cities like Washington, Boston, Chicago, Los Angeles and Toronto. Measuring half a mile high, a quarter mile thick and made of a metallic/organic material with regenerative properties the wall could easily replace destroyed sections. The walls came complete with force fields able to withstand Kang's futuristic weaponry, while its built-in cannons packed enough of a punch to destroy Kang's aircraft with a single blast. After the Master's death at the hands of Warbird, the Avengers took control of the defense walls. Taking several weeks to decipher the Plodex operating system, they then used the technology to stage a massive counter offensive. 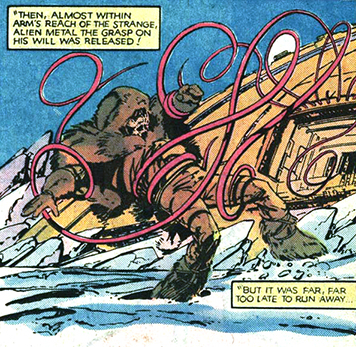 Hours after Kang had been defeated, a seemingly preprogrammed computer command caused the walls, their subterranean tunnel network and the Arctic control complex to be reduced to an ash like compound that defied analysis. Bio-engineered by the Master, most likely by using a DNA sample from Marrina, the Plodex Wolves were a feral Human/Plodex hybrid that their creator used for a variety of tasks. Possessing basic intelligence and limited speech, the Plodex are nonetheless formidable, ferocious fighters who can carry out complex orders. The Wolves share Marrina's ability to swim at tremendous speeds, covering the distance between Boston and Northern Canada within an hour. First seen while abducting a large number of government officials and taking them to the Master, they later fought the Avengers when the team tried to infiltrate the Master's arctic facility. Later still, they stalked Warbird and Kang's son Marcus before the final confrontation between the Master and the Avengers, which ended with Eshu getting killed by Warbird. Most likely all Plodex Wolves have been killed, either in combat or from starvation without their Master to either feed or guide them. Figuring out a new way to ensure mankind would evolve to become as perfect as him, the Master of the World created the Unity Process. Basing it on the technology used by the Plodex mothership to dissect, analyse and put him back together 40.000 years ago, the Master's Unity Process worked in much the same way. Only, instead of putting everything back the way he found it, Unity completely worked over the subject's molecular structure, rearranging it to be the most perfect version of the subject (while ensuring loyalty to the Master). The Unity process was programmed to recreate bodies in their most efficient physical form. This meant losing a toe on each foot and the appendix (apparently, the Master had deemed those appendages superfluous). The only known way to combat and reverse the effects of Unity are targeted doses of the Purple Woman's (Kara Killgrave) mind controlling pheromones. Named after one of the most (in)famous active volcanoes in history, Vesuvius was the Master's trained pet falcon. He was with him when the Master suffered a crisis of faith and decided to remake himself using Scramble's transmutative enzymes. Vesuvius kept his master company during the long, torturous transformation he underwent. After the process was completed, the Master arose as the perfect specimen of man. Believing himself the newly appointed ruler over life and death, he casually snapped Vesuvius' neck to prove this mastery.